I have a recurring dream in which I always say the same thing: When I am small after being born again, I want to be educated in a Nordic country, in Sweden or the Netherlands, for example. Because I won’t be looking for a new Feminism, or a new Machismo, but a New Humanism that is integrative and egalitarian, where equality reigns supreme. It will be a world that is already dawning in some countries where work, administration, the private sector, politics, economics, art, education and entertainment markets will be shared without bias, as well as new professions that don’t exist and that we can’t even imagine yet, in a world undergoing an exponential transformation where everyone will be able to choose how they want to make their contribution and seek happiness. 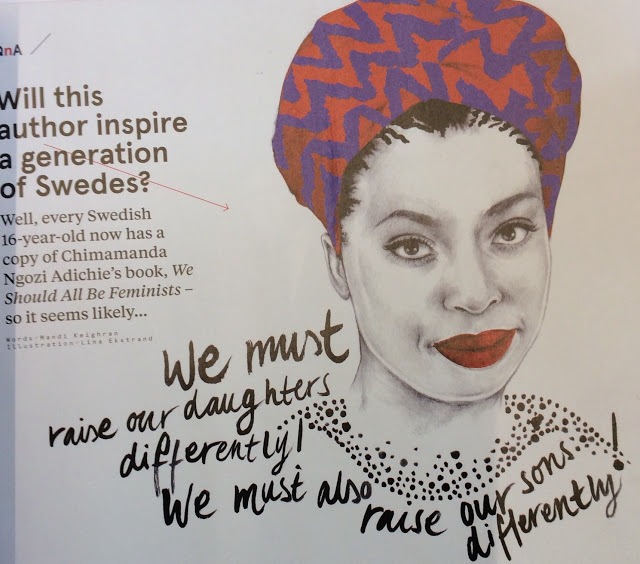 All young 16-year old women in Sweden have a copy of the book by Chimamanda Ngozi Adichie, We Should All Be Feminists. The author says that we should educate our daughters differently, and our sons too. I did not know who she was until I read an article on a Norwegian Airlines flight to London yesterday. The book began with a TedEx talk in 2013 on Feminism. It was edited as an essay by The Swedish Women’s Lobby, but my men colleagues are reading it too.